Kitchen renovations can cost you big time, but when it comes to home improvements, this is the sort of project that has a lot of pay off. It's impossible to own a home without pondering the occasional (or hey, a whole lot of) home improvements. And the great thing is that a lot of the time, creative energy, and yes, cash you spend on such renovations don't just translate into a space you love, but also into a higher home price whenever you decide it's time to sell. Only which ones offer up the biggest return on investment? To find out, we've launched this new series, Renovations That Really Pay Off—and, for our inaugural installment, we're tackling the big kahuna: kitchens. Here are six home improvement projects in this all-important room that experts say come with significant financial benefits down the road. Cha-ching! Call it a need for eye candy, but shiny new appliances—fridge, stove, stainless-steel dishwasher—have a huge impact on prospective home buyers, according to Realtor® Al Cannistra. High-end appliances are also typically the most expensive kitchen renovation, usually with an equally high ROI. Cannistra mentions one home with outdated appliances that sat on the market unsold; once the owners updated everything, “they received two offers the first week" and the house sold at “significantly higher than asking." But don't feel like you have to replace appliances at once. Just swap out what you can—when you can—so by the time your home's on the market the overall buyer impression is “Hey, nice kitchen!" rather than “The '70s sure were a crazy time, eh?" One caveat: “Keep the appliances and plumbing where they are," suggests Justin Riordan, founder of Spade and Archer Design Agency, “because the rule of thumb is to add $5,000 each time you relocate either." After appliances, cabinets are the most expensive item on a kitchen upgrade checklist, averaging between $3,900 and $12,000. So don't leap into trashing the old ones. “If you have existing wood cabinets that are still in decent shape, instead of completely refacing them, give them a fresh coat of paint," says Tracy Kay Griffin, designer for HGTV’s “Get It Sold." Rust-Oleum makes an easy-to-use Cabinet Transformation kit. Another small remodeling project with instant impact: replacing the cabinet hardware. “Choose a satin or brushed finish so they don't show fingerprints," says Erin Davis, lead designer and co-owner of Mosaik Design & Remodeling in Portland, OR. 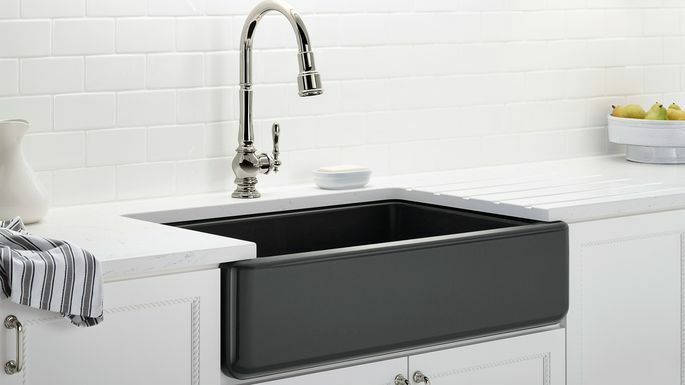 Given the sink is the most used item in your kitchen, a brand-new one will pop—even if it's on an old countertop. So consider installing one with two troughs or made of stainless steel, the most popular material, according to Consumer Reports. For the truly budget-friendly kitchen renovation option, get a fancy new faucet, suggests Griffin: “This is quick and inexpensive but can make a huge difference." The home invasion of smartphones, tablets, and other constantly charged electronics means there are never enough power outlets in a kitchen. This may explain why the National Kitchen and Bath Association's annual trend report shows that almost two-thirds of homes have rigged up charging stations where all these gadgets can easily be plugged in. Businesses such as Kitchen TuneUp can modify cabinets or drawers in one day by adding hidden power strips and other tech-friendly amenities. A new countertop may be pricey, but Realtors agree that the impact of these kitchen renovations on future home buyers is huge. And don't just take it for granted that you should go for granite; the NKBA report shows that quartz countertops have more cachet these days. Also remember that replacing a countertop “provides an opportunity to install a new glass or subway backsplash for additional punch," says Davis. “A budget-friendly option is to install a 4-inch-high splash out of the same countertop material." When it comes to kitchen floors, nothing beats good ol' wood. The NKBA report shows that wood is the most popular kitchen flooring, favored by 82% of homeowners. And compared with the fancier and hard-to-install tile options, it's a relatively inexpensive option, too, averaging $9 to $12 a square foot. Sure, knocking down a wall to create the oh-so-trendy open kitchen may seem like the thing to do these days, but in purely financial terms of ROI, it may not make much sense as a kitchen renovation. “While open floor plans remain a popular choice among buyers, the return on investment for tearing down a wall to create a great room isn’t as high as other kitchen renovation projects," says Melanie Cameron of the Cameron Team at Coldwell Banker Sea Coast Advantage in Wilmington, NC. The reason: According to Remodeling Magazine’s Cost Vs. Value Report, small kitchen renovations have a ROI that’s almost 20% higher than a major renovations. That's not to say that you shouldn't open your kitchen up if that's what you're pining to do; just don't bank on it paying off big time down the road.